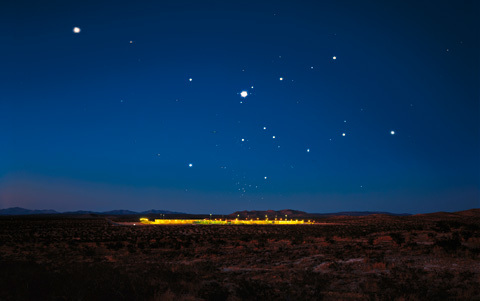 A remote prison in the desert during the blue hour. The compound prepares for the night, the lights are gradually switched on. Simultaneously to the illuminating on the ground approaching aircraft lights appear in the evening sky, one after the other, slowly accumulating, hovering, floating.